As the popular saying goes, the audio makes the man. Okay I may be making that up but getting yourself some top quality speakers is at worst a guilty pleasure and for some people an absolute necessity. Now unfortunately I’m a bit of a heathen when it comes to speakers so when the H30BT’s arrived from Microlab for review I was a bit lost. So let’s start with the parts I know about. I’ve always believed speakers should be heard and not seen and I have to admit that philosophy continues with the H30BT’s. There is nothing really wrong with the way they look but I’m not a fan of white tech gadgets personally and would much rather have seen these in a black or even a brushed silver. Up front we see the standard speaker mesh with the Microlab brand name elegantly portrayed. The base definitely looks nice and modern and the controls are set on the side and slightly back so that they don’t get in the way. Unfortunately what you can’t see from the image above is the light that is constantly on and to which I keep throwing a pair of jeans over so I can sleep. If you have the speakers plugged into a computer, TV or other device via cable the light is red but if you connect up via Bluetooth then the light goes blue. It’s a nifty little trick that has actually helped me when trying to figure out why the speakers aren’t working when I plugged them into the TV. It was because they were synched to my iPad. I had no problems at all connecting the speakers to the iPad and iPhone via bluetooth or cable. So simple even your parents can do it. I’ve also tested the speakers on the TV and computers using the cable and as you would really expect there are no problems. 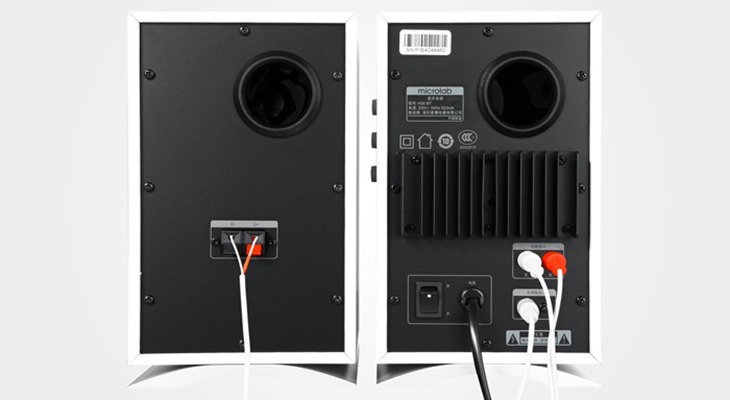 The speakers arrived with a cable that connects the headphone jack to the stereo ports on the back of the speakers. There is also a cable that joins the two speakers which is thankfully long enough to easily place the speakers on either side of a 50” TV. The H30BT’s also accept NFC so if you have one of those fancy new Android phones you simply need to tap the top of the speaker and you can instantly start playing your music directly through them. It’s a handy little ability and great for annoying your host at parties by replacing his music constantly. But looks and connections really do mean nothing in the long run as speakers are measured entirely on their audio ability. As I mentioned before I’m a bit of an audio troglodyte. I unpacked the speakers and connected them to my iPad and continued to watch my Netflix. The sound was massively superior compared to my iPad speaker but that really isn’t saying that much. I then tested on the PC and TV with the exact same results. The clarity was vastly improved and I’m not sure how I’m going to go back to watching TV without real speakers now? The one thing I did notice is that these aren’t ear-splitting speakers. The top volume isn’t quite as loud as I would expect but when playing Call of Duty with these the clarity and depth of sound was more than adequate. With the wife often reminding, nicely, that the kids were sleeping and if I wanted to continue breathing I should turn that down. All in all I was happy with them but we wanted to test them properly and so I headed over to AudioCheck to get some sound samples to test the range of the speakers. It blew me away and surpassed any expectations I had. First up I tested the Low Frequency response which is a little test where the sound (apparently) starts at 10Hz and slowly climbs up. Using my laptop speakers I first heard the background sweeping tone at around 100Hz. Geoff on his cheap speakers got it at 110Hz and Darryn with his special abilities only heard it at 150Hz. The H30BT’s? Well I felt something between 10Hz and 20Hz and could clearly hear it before we hit 30Hz. To put that into perspective 20Hz is the acknowledged level of human hearing. We can’t (generally) hear under that. Next I made the fatal mistake of testing the High Frequency response. This is a very high pitched sound that us mature folk lose the ability to hear. The sound starts at 22kHz, which is apparently inaudible, and goes all the way to 8kHz. Using these speakers I could hear the high pitch sound at 15kHz which instantly gave me a headache. I quickly tricked the team into doing the test and Darryn is still seeing last nights dinner in the bathroom. But to check that the speakers weren’t the reason I couldn’t hear higher sounds I got my two kids, 9 and 11, to test. The 11 year old heard it nearly instantly while the 9 year old repeatedly heard it at 20kHz. The range of the speakers in practice is actually quite excellent. While I was a bit wary at first my initial misgivings over these speakers were completely overridden by the quality and ability of the little guys. According to me they are just great little speakers that gave me a new-found appreciation for audio. 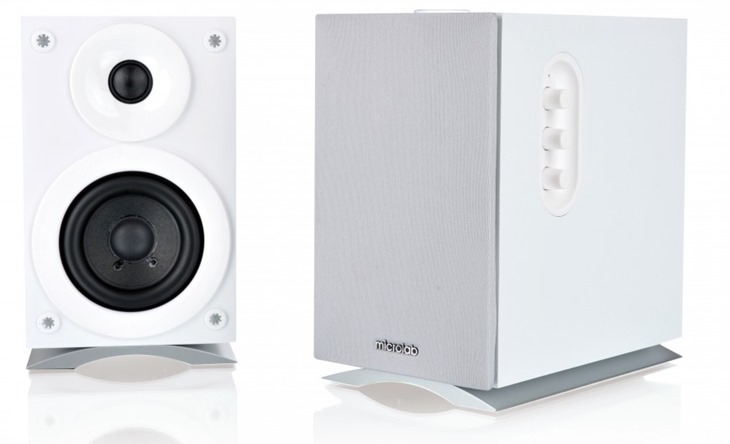 The speakers currently have a RRP of R2150 and are not yet available in store in South Africa. But they will be soon. Next article FFD: Do sales devalue games?